Tom Phillips, Texas Ranger — or not? Was Tom Phillips a Texas Ranger? This site is dedicated to finding the truth about whether Bea Elizabeth Phillips was related to the Dalton family. So much embellishment and fraud exist in the story of Tom and Elizabeth Phillips that it was decided to also examine the allegation that Tom Phillips served as a Texas Ranger. At present, until additional documentation can be found, there is not enough evidence to either validate or invalidate it. The Texas Rangers were established about 1823 but had ceased to exist by the Civil War. In 1874, the Legislature created two Ranger forces – the Frontier Battalion, led by Major John B. Jones and an organization called Special Forces under Capt. Leander McNelly. There were problems with attacks by Indians on the western border of Texas, areas served by Ranger Companies C and E. In 1874, each company was assigned 75 men but was soon reduced to 40. 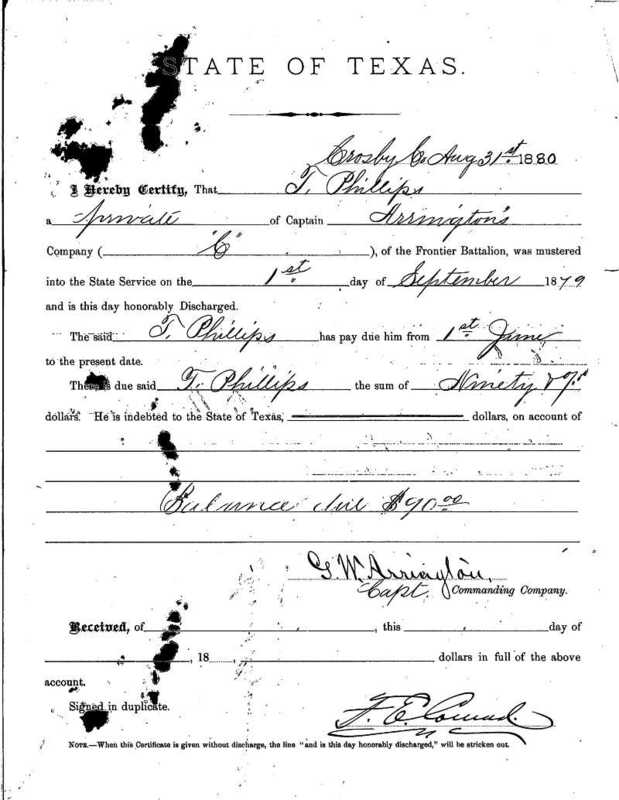 Family oral history says Tom PHILLIPS was a Texas Ranger prior to his marriage to Bea Elizabeth, or before approximately 1881. The Texas Rangers had recently been reinstated and they were undermanned and underfunded. Each Ranger supplied his own mount and equipment and it was not uncommon for a man to serve a brief time. 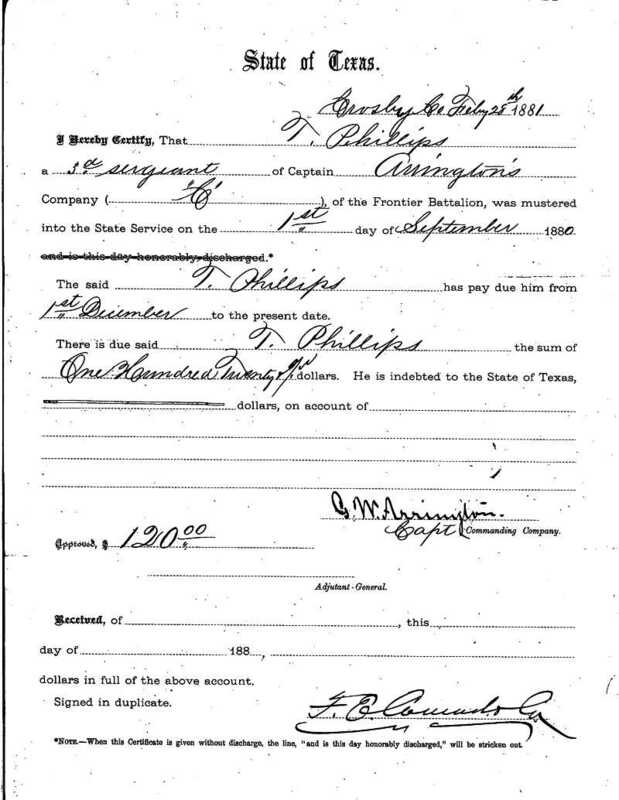 Documentation on the early Texas Rangers is incomplete, so it is possible a man could have served and there be no record of it. 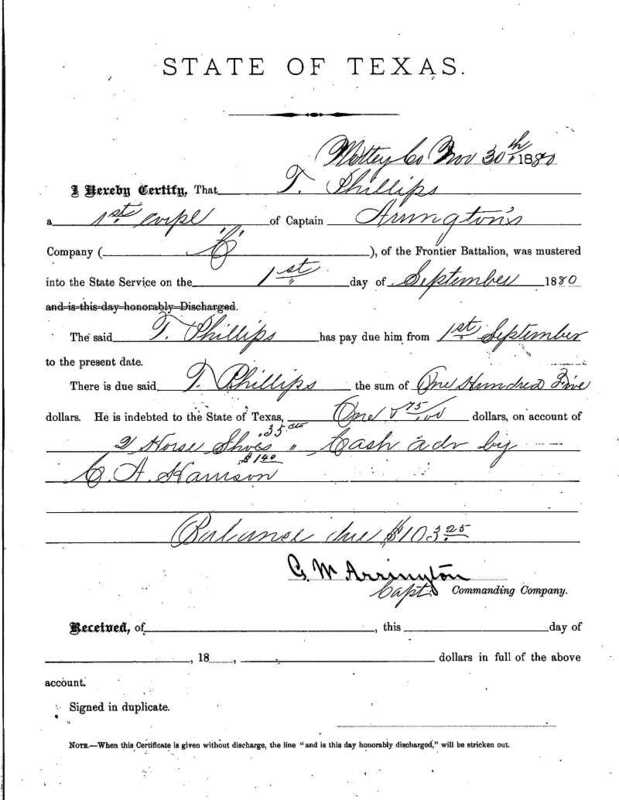 Below are documents showing that someone named "T. Phillips" served from August 1879 through February 1881. 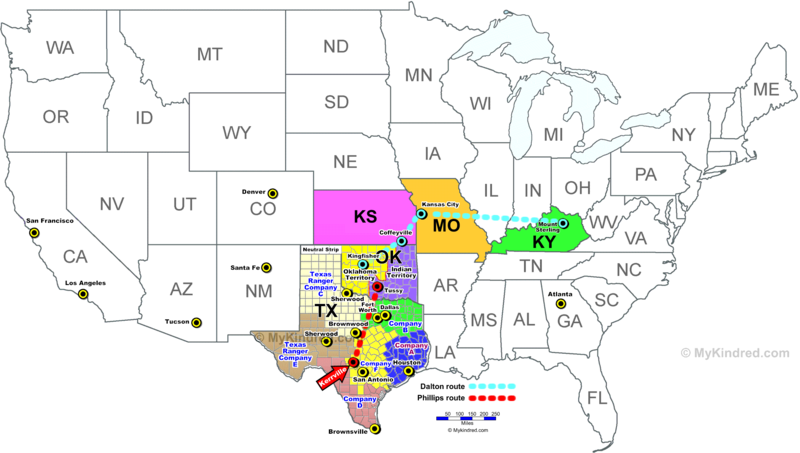 The map shows the areas served by each Texas Ranger company. It also shows Tom Phillips' home town of Kerrville. Company C was part of the Frontier Battalion (1874-1901). G.W. 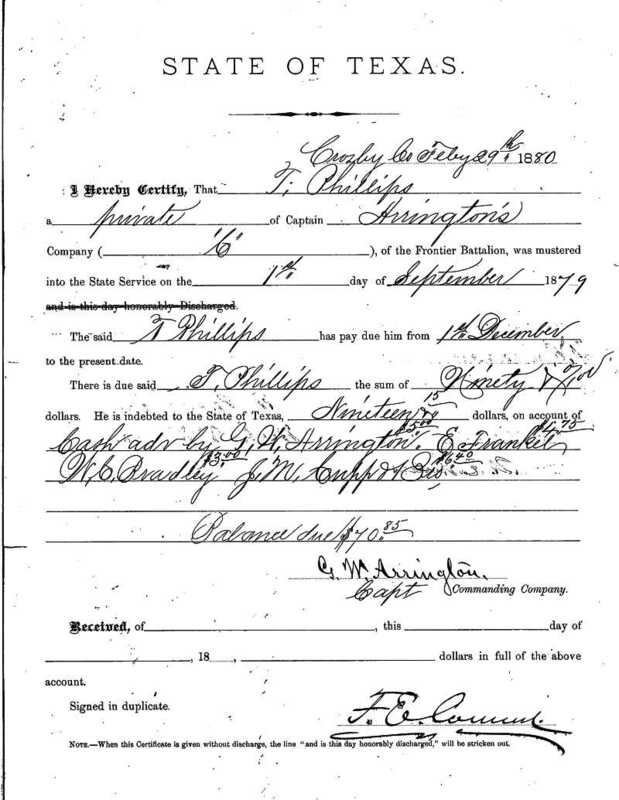 Arrington was made captain of Company C in 1878 and the next year he moved his headquarters to the Texas Panhandle and established Camp Roberts which was located on the White River in Crosby County near the town of Crosbyton (its headquarters today are in Lubbock, 35 miles west of Crosbyton). The company ranged from west Texas into eastern New Mexico through 1881 controlling renegade Indians and arresting, or otherwise handling, law breakers. Arrington resigned from the Rangers in the summer of 1882. 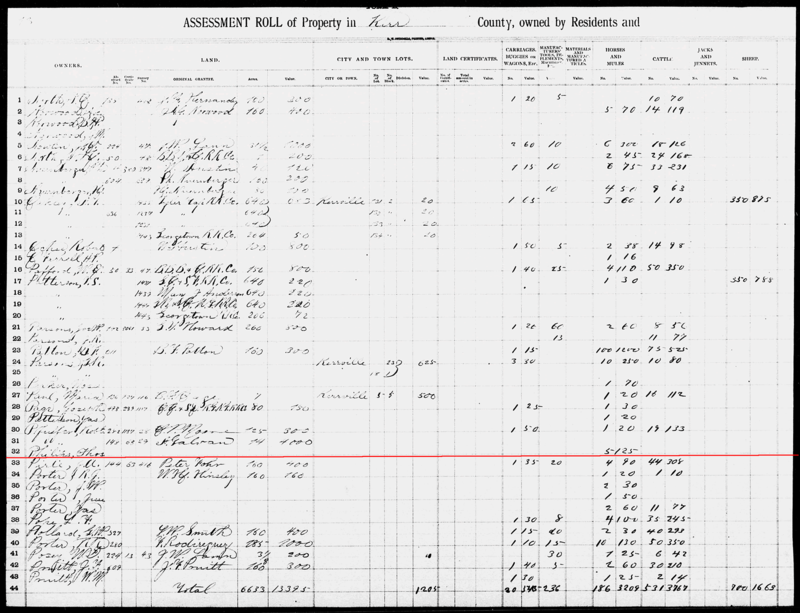 Is it reasonable to believe that Bea Elizabeth was a child of James Lewis Dalton and Adeline Younger and left home before she turned 14? 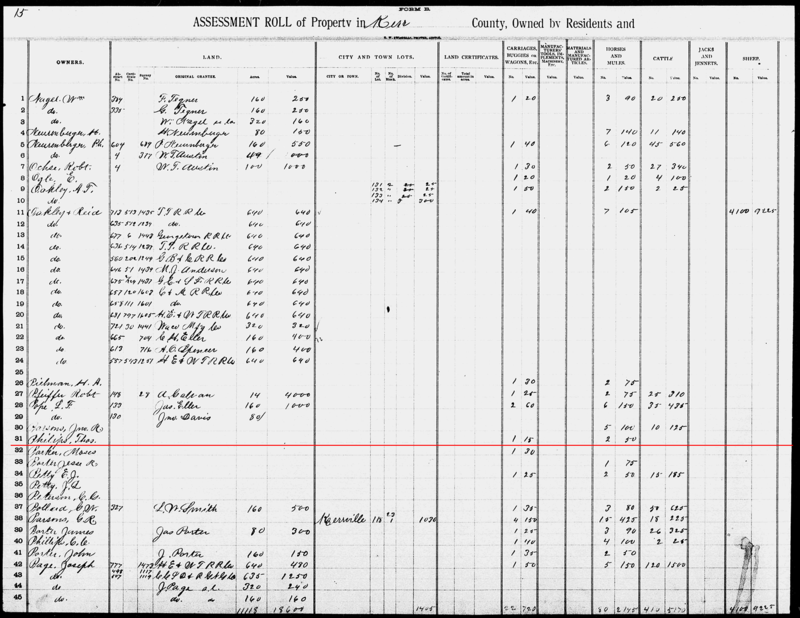 That is the story proffered by the Phillips family to explain why she never appears on any census with the Dalton family? The distances and timeline make this story difficult to believe. 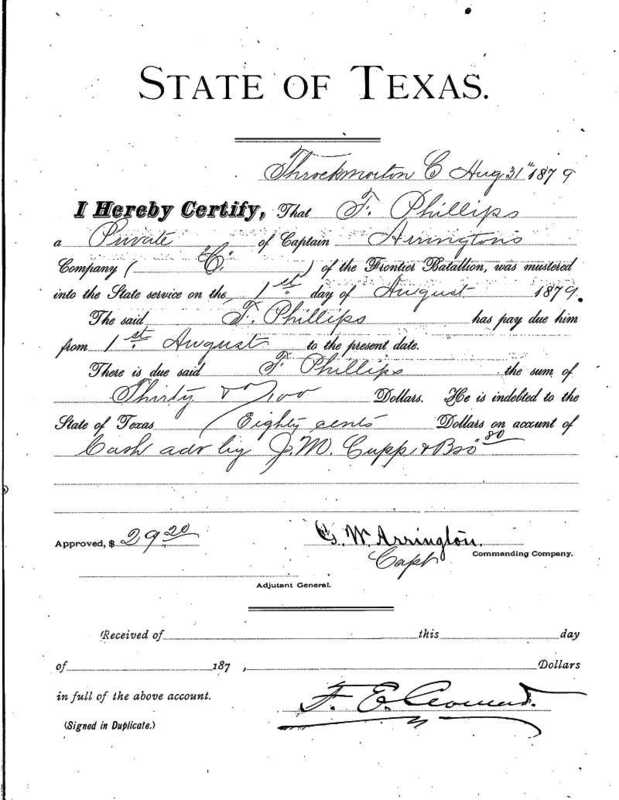 Thomas Phillips was born 1856 in Kerr County, Texas, near Kerrville. 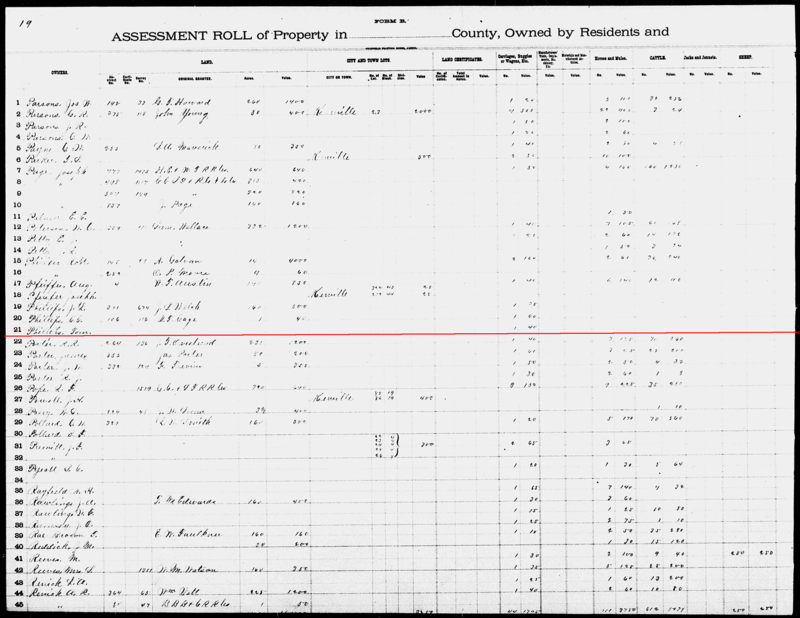 He is in Kerrville with his parents on the 1860 and 1870 censuses and he is recorded on the Kerr County tax rolls in 1881, 1882, 1883 and 1885. 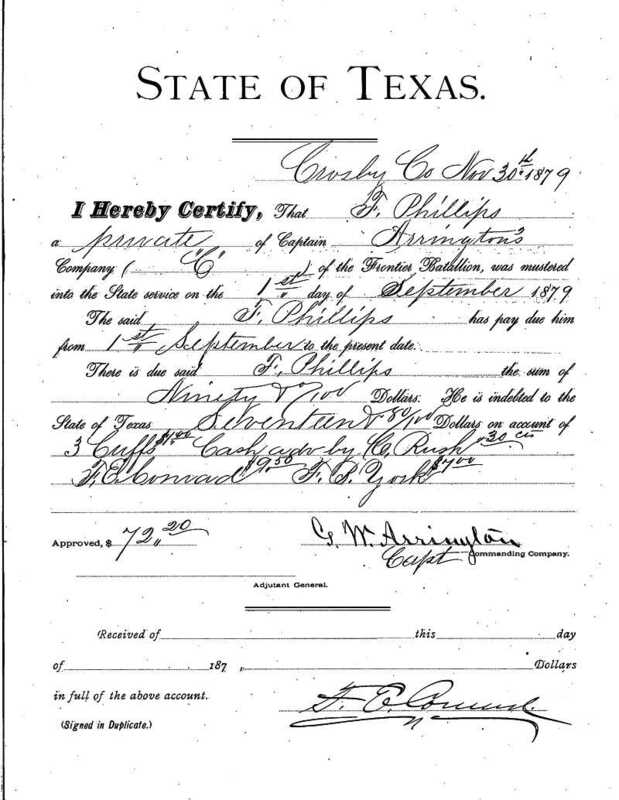 No record has been found for a marriage between Tom Phillips and Bea Elizabeth (last name unknown), but all their children were born in Kerr County, beginning in 1882 up until the birth of the twins in 1890. The evidence shows that they probably married in Kerrville. 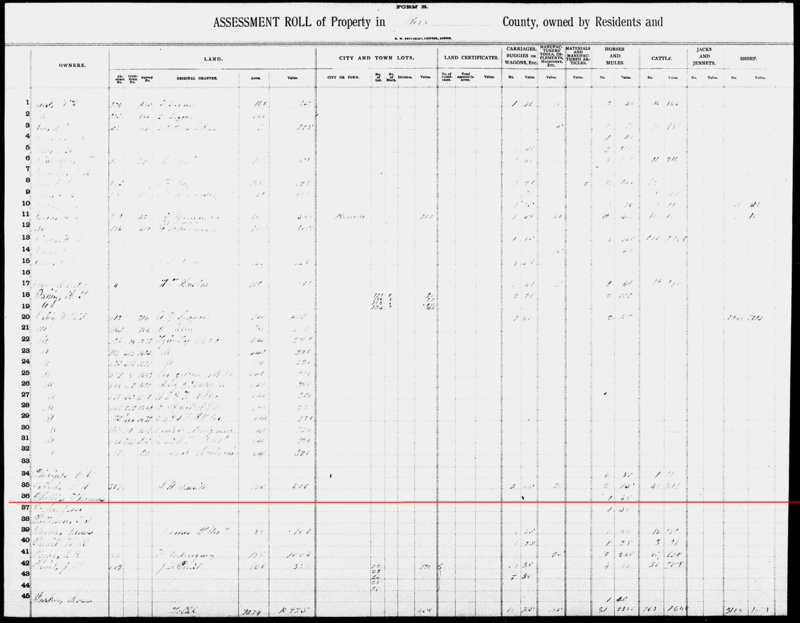 They were in Kerrville in 1890 for the birth of their last two children, twins, and then Tom Phillips appears on the 1900 census for Tussy, Indian Territory, a widow with his five children. 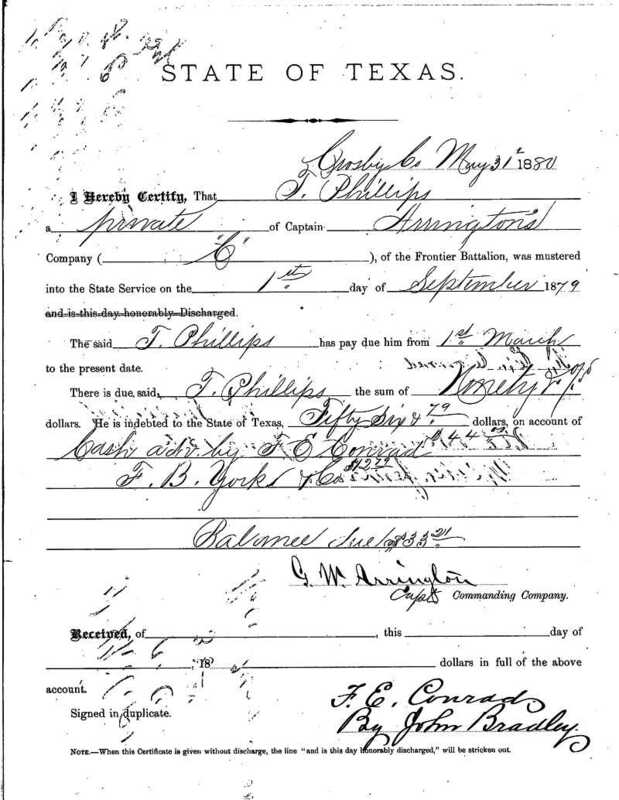 In his NOLA article Bill Phillips says his grandparents Tom Phillips and Bea Elizabeth married in Brownsville, which is in far south Texas across the border from Matamoros, Mexico and on the Gulf of Mexico but his genealogy says they married in Brownwood. 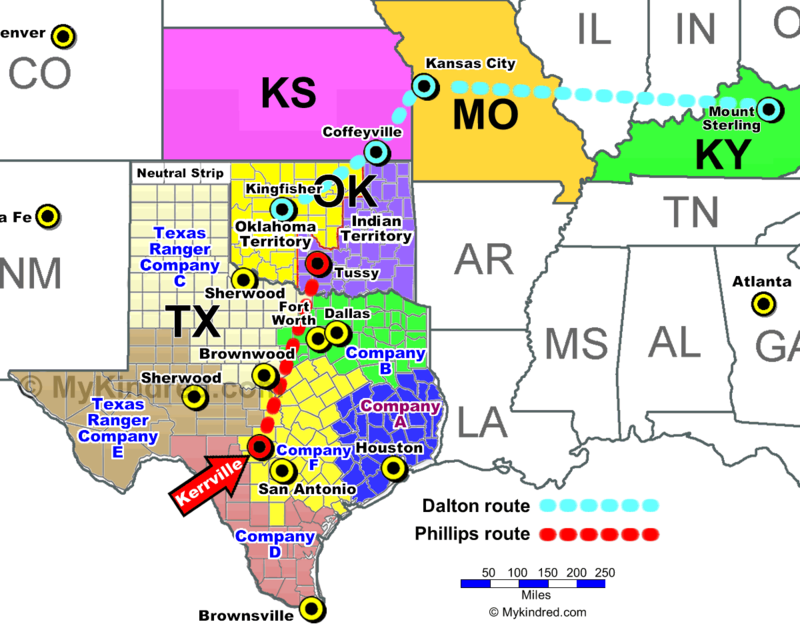 Brownwood is 470 miles north of Brownsville in Brown County. All the evidence, except for the falsehoods of their grandson, shows the Phillips family in Kerr County until they arrive in Indian Territory.